at the State Fair Grounds in Timinoum, MD on February 1st & 2nd, 2019. We invite all to come and see us. Looking from the east end of the "S". Looking from the west end. We do have a Facebook page at Capitol Free-mo that you may like. 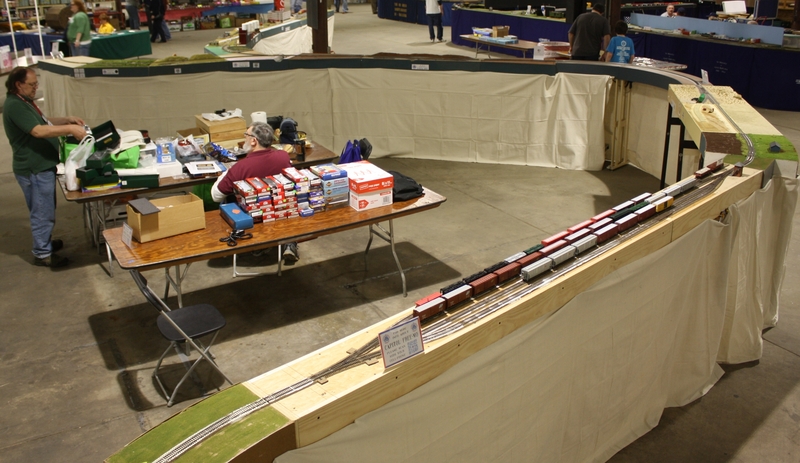 Joseph Ricard, of Trackside Scenery, interviewed Clarence Guenther about Free-mo and Clarence's module at the January-February 2015 show. This became a part of video about modular railroading that Joey has put on their website. It can be seen by clicking here - Clarence's part starts at the 7:18 mark. Shawn Fenn took some video during the February 2014 show. It can be seen by clicking here. Mike McNamara took some video from his "I-Car" during the February 2012 show. It can be seen by clicking here. The Capitol Free-mo Modelers is an open group of model railroaders who construct, operate and display an HO scale Free-mo modular model railroad at locations in and around the Washington, DC area. The group is a free form group, as there are no elected positions, no dues, and no club property. Each member purchases the needed materials and builds their module according to their interests using the Free-Mo standards. We will work to make group purchases as able, but costs will be shared. See http://www.free-mo.org for further information on the standard.